Signage is a really important part of your craft show booth. The fact is that you can’t possibly communicate everything you want to tell your customers. You may have lots of people in your booth (lucky you) and you’re unable to connect with everyone. Or perhaps you have a customer who clearly would prefer to shop quietly, without being bombarded with conversation. The best thing you can do is to use signage to act on your behalf. When considering what kinds of signs to use, start by putting yourself in your customers’ shoes. What are the most important things they’d want to know about your work? To be most effective, your signs should communicate information in a clear and concise manner. In addition, your signs should fit in to the overall style of your booth. For book artists, signage is especially important. You’d think that books are pretty self-explanatory. Who wouldn’t know what to do with a photo album? Over the years, I’ve been surprised by how often customers become confused by handmade books. I think that part of the problem is that I’m usually the only bookbinder at a show and customers have nothing else to compare my work to – this makes it hard for them to understand my prices. In addition, I think that people become overwhelmed by craft shows and the amount of work that has been collected in one place. This is why signs are so valuable – they can help people focus on your work. Be deliberate in your choices and only use signs that enhance your work - you can have too much of a good thing. So beyond the obvious (business name, prices, etc. ), what signs are useful for a book artist? Acid-free/archival: This is really important to the customer shopping for a photo album. Make sure people know that you use archival materials that will ensure the longevity of their photos. Potential uses: Don’t assume that people know why a photo album is a great gift. Tell them that it’s perfect for a wedding, graduation, baby naming, family reunion – you get the picture. The same goes for journals – document travels, gratitude journal, etc. Page paper information: People have concerns about how paper will respond to the type of pen or media they use. Will it bleed? Does it take watercolors? Make a sign that demonstrates how different pens look when used on the page paper. Technique/Materials: People like to learn about how a particular binding is done or what country your cover paper came from – it adds to the story and shows how your work is special. I have a sign near my chopstick journals that explains how Chiyogami is made. Is it one-of-a-kind or part of an edition? This kind of information is important to collectors. Is the piece signed and/or numbered? Is it in any notable collections? All of these things add to the value of your work. Environmental shots: Signs don’t just have to include words – remember that a picture is worth a thousand words. The image should help a customer see your work in their life. For example, I have a photo in my booth that includes one of my journals and a cup of coffee on a table by a window. Can people touch your work? Do you want them to wear gloves? If you create books with content, people will want to pick up your books to get a look inside. According to Bruce Baker, people are 4x more likely to purchase work that they have held in their hands - make sure customers know how you feel about having your work handled. 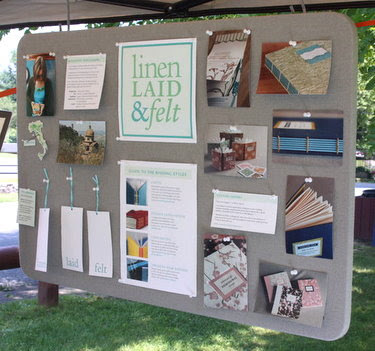 Katie's tack board hangs in her booth at craft shows and includes information about custom orders, binding styles, an artist bio, and samples of materials. The information is presented in a really attractive and easily digestible way. It's brilliant! What signs are you using in your booth? Is there other information that craft show customers should know about handmade books? I'd love to hear about it! And if you have images of your use of signs, let us see them! Send me an Email with photos and I'll try to include them in a follow-up post next week. Be sure to include your name and a link to your Etsy shop. Thank you for this post - it is very useful. I need to design and make some signage for my next craft fair/show. I didn't have anything on my first stall last November; next time I really must!